The Parliamentary Committee on the Office of the Valuer General monitors and reviews the exercise of the Valuer General's functions with respect to land valuations. The Committee does not have the ability to review individual valuations or objections to individual valuations. The processing of these issues remains the responsibility the Valuer General. The Committee can monitor valuation methodologies, the arrangements under which valuation contracts are negotiated and entered into, and the standard of valuation services provided under such contracts. The Land Valuation Advisory Group (LVAG) monitors the quality of land valuations and provides a channel for communication between the Valuer General and stakeholders. Shopping Centre Council of Australia. 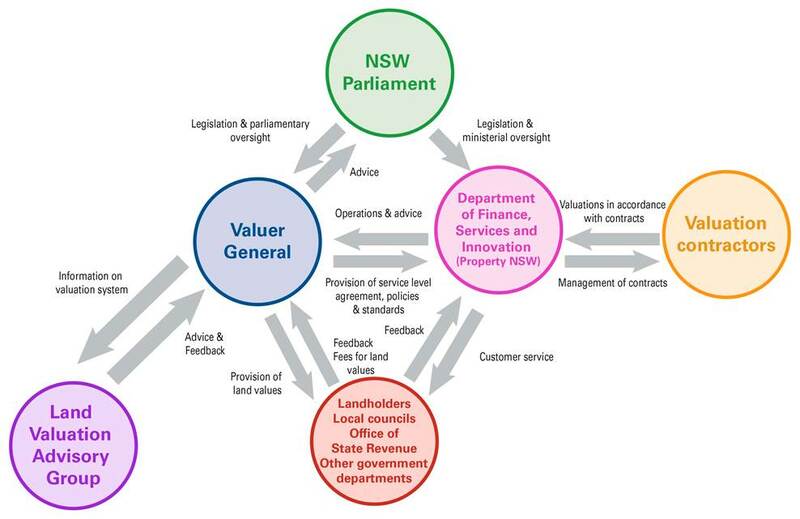 sponsor and oversee projects to improve the quality of the NSW valuation system. The Valuer General reports administratively to the Minister for Finance, Services and Property and the Secretary of the Department of Finance, Services and Innovation.